Being the foremost names of the industry, we are involved in providing an extensive range of Dough Moulder. 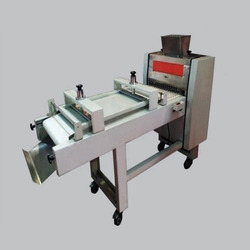 Machine is suitable for auto panning or cross panning process. 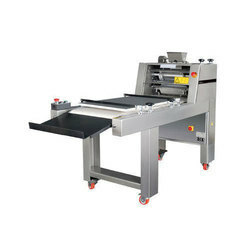 Machine is fitted with three pairs of stainless steel or teflon rollers with rollers gape adjustable & scraper mechanism. Pressure board is made out with mica / stainless steel. Leveraging on our team, we have been able to bring forth an exemplary range of Dough Moulder . These presented products are precisely fabricated utilizing premium quality basic material, procured from the established vendors of the markets. Furthermore, in order to cater to the divergent demands of the clients, we offer these products in different sizes and specifications. We offer a comprehensive range of Dough Moulder Model- 1, which is specially designed for meeting the varied demands of small scale and large scale bakeries. Uniquely designed, this model is available in well-defined specifications. Ideal to be used for varied types of dough, these models can be availed from us in tailor-made options. Dough Moulder machine as a bread making plant can be used for all types of dough in small and medium sized bakeries. Construction : The construction is simple, safe and open. All moving parts have ball bearings. We are offering Rotary Moulder (Soft Dough Making Machine) which is used for soft dough and soft variety of biscuits. The dough to be moulded is fed into the hopper and a forcing roller forces the dough into the cavities of the moulding roller. It is made out of gun metal, uniformly engraved and coated with food grade teflon. Dough Moulder gives even and tight rolling of dough to give uniform texture and crumb structure. It handles the dough so gently that will not tear the gluten , but still uniformly distributes the air pockets , to give a close crumb structure. Doubles the production in half the time and minimizes table work. We are offering best quality & wide range of Moulders. SRK Tools & Moulders Pvt. Ltd.
- Ideal for soft dough and soft variety of biscuits. We are engaged in offering a quality approved range of Dough Moulder. - Required for bread make up system. - Must for bread, rusks dough to attain best optimum results. - Fitted with six stainless steel [304 gr.] rollers with adjustable teflon scrappers [Long loaf moulder]. - Adjustable metal press board for perfect results. We are offering Dough Moulder to our client.